As strong as the tone and atmosphere are in the Symbaroum Core Rulebook, it did not explore or deliver on the raison d'être at the heart of this Swedish RPG. That is, having the player characters set out from Thistle Hold in the newly founded kingdom of Ambria to venture into the Davokar Forest where they might hunt for treasures and search for the secrets of the lost empire of Symbaroum that the forest now covers. This was disappointing, but it did mean that future supplements would have to deliver on the hints and mysteries that at the outset, Symbaroum promised. 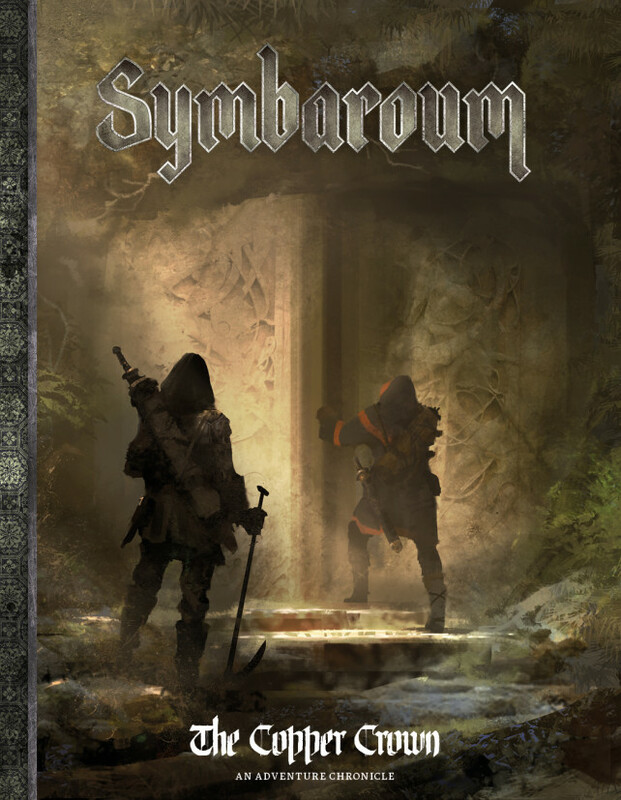 The good news is that The Copper Crown, the first supplement for Symbaroum to see print, delivers on said hints and secrets, and further, fulfills the promises of both the setting and the set-up in Symbaroum. ‘The Mark of the Beast’, the first and shorter of the two scenarios, is a murder mystery set in Thistle Hold. A serial killer is on the loose in the frontier town—though the authorities would prefer not to acknowledge—but the flurry of flayed and mutilated bodies that have appeared in the town’s alleys is hard to ignore. The player characters will be drawn into this plot when a contact of theirs gets involved. This quickly puts them on the track of some treasure hunters that might be connected with the men who were being hunted by the Elves as they travelled through the Titans. If they brought some bad back from the Davokar Forest, then what of their compatriots in Thistle Hold? Essentially, if ‘The Promised Land’ prefigures the events of ‘The Mark of the Beast’, then ‘The Mark of the Beast’ is a bloody, gruesome piece of Grand Guignol that sets up everything for ‘Tomb of Dying Dreams’. This takes the player characters into the Davokar Forest, ostensibly to determine the fate of an Ordo Magica expedition sent to excavate an ancient tomb, but in actuality, following up on the consequences of a previous treasure hunting expedition that they encountered in ‘The Promised Land’ and ‘The Mark of the Beast’. The denouement comes in the focal point for any treasure hunting expedition—and as the title suggests—a tomb. It is a nasty little affair, complete with a number of deadly traps, but it is not what is really interesting about ‘Tomb of Dying Dreams’. Instead what is interesting about the scenario are the factions and entities interested in the tomb and its content, the entities in particular. All three are ancient creatures or things, some inimicable to mortal life, some willing to deal with mortals if only to have them as their agents—at least temporarily. One of those entities should be of particular interest to certain of the barbarian tribes in Ambria, though this is not mentioned in the scenario itself. Besides the two scenarios, The Copper Crown comes with an appendix of new rules and a septet of new artefacts. The new rules mostly consist of new traits, but the new artifacts are quite singular items. Together with the events of ‘The Chronicle of the Copper Crown’, they highlight how nasty some of the artefacts from the past really are. That said, there are objects here that the player characters will appreciate possessing. Rounding out The Copper Crown is a set of handouts for the two scenarios, all done in vibrant colour. Amongst the artefacts is mention of the Dwarves. This is the first mention of them, at least in the English language version of Symbaroum, though they are detailed in the original Swedish RPG. So technically, discussion about the Dwarves is not a secret, but The Copper Crown does actually begin to explore the secrets of the setting for Symbaroum. So we learn something of the region’s history prior to Symbaroum, its geography, and one of the reasons behind the Iron Pact. Not in any great detail, no more than a sentence or two, but certainly more information than was given in the Symbaroum Core Rulebook and it lays the groundwork for supplements to come. There are some oddities. Notably in the choice and range of measurements used, which veer between Metric and Imperial and back again whilst also stopping off at the use of ‘fathoms’ as an indication of height. Putting aside the fact that this is actually a nautical measure of depth, surely this inconsistency should have been picked up during proofreading? Now normally, Reviews from R’lyeh would simply mention that a book needs further editing or proofreading, but in this instance, the use of multiple, often inconsistent terms is confusing and warrants the specific highlighting of the problem. Which is essentially, poor localisation. The other oddity is that The Copper Crown does call for quite a range and depth of Abilities—the Loremaster Ability in particular, and that at Adept and Master on several occasions. For a first campaign and what may be the second and third scenario they are playing, this is quite a high demand for the player characters. Now in ‘The Mark of the Beast’ a solution is offered, that of getting an NPC to step in and help with getting a particular clue or piece of information. If they do that, the player characters automatically get the clue, but in return they owe a favour to the NPC that helped them. So far so good, so standard storytelling and roleplaying interaction between the player characters and the NPCs, but the scenario, and thus Symbaroum, go one step further in cementing this relationship. Whilst the player characters may have gained the clue, they will not benefit from any experience gained in doing had they otherwise learned the information themselves until they fulfill the favour for the NPC. This is an interesting storytelling mechanic that will build and cement relationships between the player characters and the NPCs and the setting itself. Unfortunately there are no suggestions as to what the NPCs that give their help in ‘The Mark of the Beast’ might want and that is a missed opportunity. Physically, The Copper Crown is well presented with the same clean layout as the Symbaroum Core Rulebook. Aside from the oddity of the mixed measurements, the editing is better than in the Symbaroum Core Rulebook. As with the Symbaroum Core Rulebook, the artwork in The Copper Crown is excellent, some of it old, some of it new, and at its best, giving a sense of ominous grandeur. Although the two scenarios in The Copper Crown could be played separately, doing so would miss the plot, the scope, and the underlying theme of the trilogy formed together by ‘The Promised Land’, ‘The Mark of the Beast’, and ‘Tomb of Dying Dreams’. All three can be summed up in the dangers inherent in exploring the Davokar Forest, in hunting for treasure, and in dealing with beasts and forces beyond the understanding of mankind. When coupled with the brutalism of the setting and the challenges this presents, The Copper Crown is a solid scenario that serves as an effective showcase for both the setting of Symbaroum and and its set-up.